Dark Souls II can be notoriously difficult for the uninitiated. Sometimes we all could use a bit of help. Well I am here to help you! If you've never played a Souls game, be prepared for a pretty sharp learning curve. Chances are, you will die a lot while learning how the game works. Make sure you go don't skip the tutorial area in the beginning, right after the first bonfire. This is vital, as it will teach you the basic controls. For the love of the sun, talk to every non-player character until you exhaust all of their dialogue options. If you do, they will often relocate to your town. This not only makes them easier to get to, but also is vital for unlocking certain parts of the game. 3. Hold on to your souls. Every time you die, you lose Souls. Souls are the currency of Dark Souls II and are used for both vendors and leveling. If you can manage to return to where you died—before dying again!—and touch your bloodstain, you can retrieve your lost Souls. Be sure not to hold on to too many Souls at one time and to regularly fast-travel via bonfire to level up. 4. Visit the Emerald Herald. Like Demon's Souls, leveling is done via a maiden in the hub town (Majula). Dark Souls II's maiden is called the Emerald Herald. You can also use her to increase the number of Estus Flasks you have if you trade Estus Shards. Estus Flasks are health potions that refill every time you visit a bonfire. 5. Customize your character around your play style. Stats matter, and choosing them dramatically affects what weapons, magic and equipment you can use. Different play styles call for different builds. Attunement, faith and intelligence are useful stats for casters, depending on what branch of magic you want to focus on and how many spell slots you need. Strength and Dexterity both dictate the attack power of melee weapons (depending on the weapon). Vigor is good for raising HP, Endurance is great if you want to increase your maximum stamina and Vitality is good if you want to be able to wear heavier armor. Lastly, Adaptability dictates how fast you move, your poise and how susceptible you are to status ailments. Play around and find a build that works for you. 6. If you really screw up, hit the reset switch. If you screw up while leveling, one of the old women you meet very early on the game will let you restart your stats in exchange for a certain item called a Soul Vessel. You can find these a few times in the game, but keep in mind they are fairly rare. Unlike previous Souls games, normal enemies will eventually disappear if you kill them too often. If you're having an incredibly difficult time staying alive long enough to reach a hard boss, keep this in mind. There are multiple items you can burn in the fire to make the game easier or harder. Sublime Bone Dust allows you to permanently strengthen your Estus Flasks, and Human Effigies limit invasion from other players. The real hack is using Bonfire Ascetic. Using it in a bonfire will not only respawn and strengthen the normal enemies at a harder difficulty around the bonfires, but also treasures and bosses as well. This means you can double up on particularly sweet treasures in areas or farm bosses for large souls. Pharros' Lockstones are consumable general-use keys meant to be used on the weird stone faces you see on walls early on in the game. They are very rare early on and usually unlock some sort of mechanism or treasure. Later on in the game they become slightly more plentiful, but what they unlock becomes slightly less consistently-good. 10. Become a ladder master. Both climbing up and sliding down ladders can be sped up by holding the O button (PS3 version) or the B button (360 version). This is particularly useful if you're trying to escape a nasty group of baddies and can only reach a ladder. Tapping that button will make you jump from the ladder, however, so keep this in mind lest you throw yourself to an early death. 11. Remember to upgrade your stuff. Once you've settled on a piece of equipment, be sure to upgrade it at the Blacksmith in Majula. Upgrading requires various forms of Titanite and Souls, which can be found in the world or sold by certain merchants. This has a dramatic impact on exactly how much damage you can do. 12. Join a covenant, all the cool kids are doing it. Covenants are groups you can join in Dark Souls II that allow you to customize your play experience. If the game is a bit hard for you early on, try joining the Way of Blue. Crestfallen Saulden gives you the opportunity in Majula, along with a ring that slightly improves your HP. If you want more of a challenge, try joining the covenant that the Victor's stone gives you. The Victor's stone is also in Majula, on a cliff. The cat in Majula will let you abandon covenants, should you decide to change your mind. 13. Stock up, and check back frequently. The weapons and armor merchant in Majuna updates his stock throughout the game. This is particularly important in the last part of the game, when he gets some very powerful items. 14. You stay classy, Dark Souls II. Your starting class doesn't matter as much as you think it does. Different classes get certain things earlier than others (particularly the magic casters) and certain classes have slightly better starting stats, but once you get into the meat of the game, you can level yourself in whatever direction you want. Choosing the deprived will give you the most number of stat points in the long run, but you will start the game naked and weaponless. 15. Manage your stamina bar. You're only as mobile as the amount of stamina you have. Running, dodging and attacking all take up stamina, and blocking will reduce the rate at which it builds back up. Combat in the Souls games is very much about taking this into account, and judging that against enemy movement patterns. Err on the side of caution, and make sure you don't over commit to an attack if it leaves you prone. Monsters in Dark Souls II are much harder to deal with in groups. If you can draw out enemies individually and face them one-on-one, do so. Getting ganged up on can lead to some nasty, frequent deaths. Though you can carry as much as you want in your inventory, you can only put so much on your body. Vitality determines what your maximum equipment load is. Equip armor and weapons too heavy for you and you move slowly. Keep that in mind when selecting stats and equipment. If you're still stuck, here are some tips and tricks that some players might consider spoilers for the early game. This includes locations of useful, early items. For those of you that want to figure stuff out on your own, here's your chance to bail. The tutorial area near Things Betwixt has two really cool quirks in it: The Coffin and the Crow's Nest. The coffin is down by the beach defended by two (yes, two) very large, hippo-cyclopses. Once you defeat them, you can enter the coffin. When you do, you will switch your gender. It won't help you beat the game, but it's cool nonetheless. The second quirk is the Crow's Nest. Crow's nests, like Sparkly's Nest and Snuggly's Nest are a running theme within the Souls games. If you leave certain items (in this case "Smooth and Silky" items) in the nest, then returning to it later, you will be rewarded with an item. If you have the Petrified Something as a starting gift, you can exchange it here. There are two places to get good weapons off the bat. First is the knight by the tree in the Forest of Fallen Giants. You'll find him up a ladder just after the first bonfire. By killing him, you can get the Heide Knight's Sword, which has a lightning attack. Keep in mind, he does show up later in the game a few times, so you might want to hold off if you want to see him show up in your game later. Update: Commenter falloutthirteen points out that they are different knights, and he has killed them multiple times so far. Go to town! The second valuable item is a flaming sword hidden in a cave in Forest of Fallen Giants. Go to the second bonfire, climb down some scaffolding and go to the ground. There should be a fire breathing lizard at the end of the cave. Run in between fire bursts, open the door, and grab the sword. 5. The Pursuer is a jerk. The Pursuer boss is very very hard considering how early you fight him. Don't be afraid to explore another part of the game and return later when you are more powerful. 6. The Well hides a magnificent secret. Within Majula, there is a well with a rock on it. Hit it, and you will get an item that will make the beginning of your game much much easier. In Heide's Tower of Flame, there is a very important ring right outside the Cathedral of Blue. Starting from the first bonfire, take a left when you hit the fork in the road. Kill the sentry, pull the lever, and drop the drawbridge. A ring is right before the mist door and will lessen the amount of health you lose when hollowed. Make sure you don't miss Cale the Cartographer. He's an NPC that is tucked away in a cave near the second bonfire in Forest of the Giants. Talk to him enough, and he will give you a key to the locked house in Majula, and return there as well. His house contains a couple of key items. 9. The Hag, Her Stone and The Ring. The merchant hag Melentia at the second bonfire in Forest of Fallen Giants carries a slew of items that will help you out. The key to the blacksmith's house is absolutely vital, but the Pharros Lockstone is handy as well, as it allows you to unlock an area underneath a ballista ambush in the following area. Dodge the ballista fire, defeat the enemies, and climb a ladder down. Use the Pharros' Lockstone on the face you find and grab a very useful ring that will increase stamina regeneration speed. If you can't get down the well in Majula without dying, talk to the cat in the house nearby. She has an item you need to get down there. 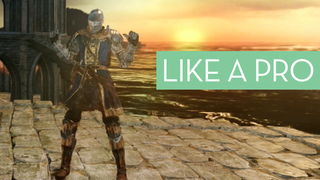 Those are just a few tips for getting a running start on Dark Souls II. Now it's your turn — if you have more tips for getting a leg up on the game, feel free to leave them in the comments. You can read our review of Dark Souls II here. Note: This article was originally published on March 12, 2014. 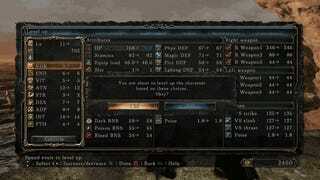 It has been bumped up since the PC version of Dark Souls II just came out and PC gamers deserve tips, too.